Newly Renovated Modern Beach Home! Golf Course Views! 5 Minute Walk to Beach! 2 Ensuite Bedrooms (1 on 1st Floor), 5 bedrooms total and 3 baths and 2 half baths. Sleeps 12. 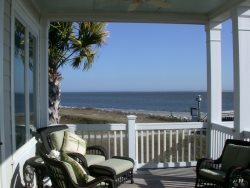 Oceanfront ~ Best Location on the Entire Island! Property Size 3,482 sq. ft.
Come enjoy this FABULOUS contemporary beach retreat – perfect for large family gatherings or multiple couples’ getaways. Book now – the new owners have completely renovated this 5-bedroom home that is only a 5-minute walk to the beach and located on the 17th green of the Crooked Oaks Golf Course – dates are filling up fast! This home is a very unique blend of style and functionality - its custom curated artwork and modern beach décor are cohesive throughout the entire home, yet it is extremely comfortable, kid friendly, and has multiple places to retreat and relax and to entertain lots of friends and family. It will have you in vacation mode in no time, but with high internet speed, smart TV’s and wifi boosters, you won’t lose contact with the rest of the world…unless you want to! The double story open living room is flooded with natural light and custom-made artwork from local artists and features a large custom-built wood and concrete fireplace. It has beautiful views of the golf course and includes a 70” smart TV so you don’t miss your favorite game! For additional entertaining, there is a second living/game room with another 70” TV and two sectional sleeper sofas that are perfect for cozying up for movie night and provide additional sleeping space (2 full-size beds). The large eat-in kitchen on the first floor has all new stainless-steel appliances, is well stocked with quality cookware (and a latte machine!) and is fully equipped with brand new kitchen tools, small appliances and serving ware to meet all of your entertainment and meal prep needs. The adjoining spacious dining room is perfect for large family holiday meals and looks out onto the deck, which is the perfect spot to enjoy a cup of coffee or glass of wine while watching the local deer and other wildlife stroll through the yard. The utility room and half bath are also located just off of the kitchen. The upstairs includes a large master suite with a king bed, fireplace and a completely renovated bathroom that features a large walk-in shower with dual shower heads and custom-built seat, and a double-sink vanity with gorgeous quartz countertops. The second upstairs bedroom with a king bed and large bay window shares a jack-and-jill bathroom with the third upstairs bedroom featuring two twin beds. The ground level has a second master suite with a king bed and newly renovated en suite bathroom that has a walk-in shower and a pedestal sink. There is also a large second bedroom on the ground level with two twin beds and a giant swing chair, perfect for curling up with a good book. Got little kiddos? So do we and we’ve got you covered – kitchen is equipped with a complete set of BPA-free plastic cups, bowls, plates and utensils, and we’ve got lots of games, puzzles and beach toys. Baby gates and pack-and-plays are available upon request as well! Amenity cards are included in the rent and give you access to the Beach Club oceanfront pools (seasonal), Pelican's Nest outdoor restaurant/bar (seasonal), Island House restaurant/bar, golf and tennis. Additional fees are charged for all activities except outdoor pool usage. These cards also allow access to the Lake House facilities (outdoor pool, playground and basketball court/no fees; indoor pool & fitness center/fees apply). If you feel like taking a day off from the beach, Seabrook Island is a short 35-minute drive from Charleston and our guest book has all the information on the historic tours, great restaurants, and family-friendly things to do there. Freshfields Village is a bike trail ride or short car ride away and is full of great shops, restaurants, and a well-equipped grocery store with lots of organic options. There are also concerts in the park there on Friday nights during the summer. Bohicket Marina is right outside the island gate and has dolphin tours, shops, restaurants, and live music in the summer time. Fishing charters, crabbing, kayaking and deep see fishing are also available. Propane tank can be picked up at local hardware store.